Please help our community — upload your photos of 25920615. This is a sensor, tire pressure indicator (includes black valve cap) (5.890) (acdelco #25920615) (service component of sensor kit 92215950) (all non high-perf apps prevent serv'd with metal stem now serv'd with rubber stem), for Hummer, Chevrolet, Chevrolet Trucks, Buick, Buick Trucks, Pontiac Trucks, Cadillac Trucks, Pontiac, Cadillac, and GMC Trucks automobiles. It fits for 498 General Motors vehicles which were sold in the U.S. from 2006 to 2013. It's a genuine General Motors part with an OEM part number 25920615, and corresponding ACDelco part number 25920615. Please keep in mind that this sensor is interchangeable with 20923680 for the U.S. market since January 1, 2012, and was replaced with 20923680 for Canada market on February 28, 2009. This sensor has a weight of 1.12 ounces, usually, it comes in a set of 1 item in retail packaging. Bulk packaging options for wholesale buyers are also available and include as follows: a cardboard box of 30 units (UPC-A: 20707773478060), and a pallet of 150 cardboard boxes with a total of 4500 units (UPC-A: 60707773478068). This sensor comes in retail packaging with weight of 1.12 ounces. Carton packaging contains 30 units in retail packaging and has a UPCA code 20707773478060. Pallet packaging contains 4500 units in retail packaging and has a UPCA code 60707773478068. All the data on these charts reflect users search interest in GM 25920615 part based on search requests on oemcats.com website made between 2012 and 2018 years. Search interest in GM 25920615 part aggregated by months over time. 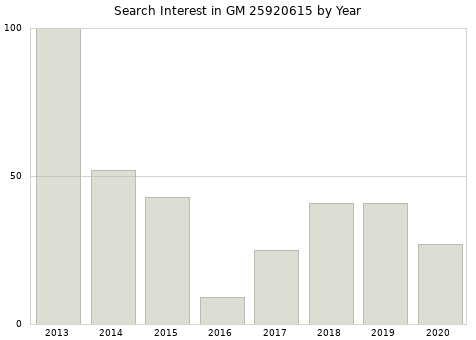 Monthly average search interest in GM 25920615 part over years from 2013 to 2018. 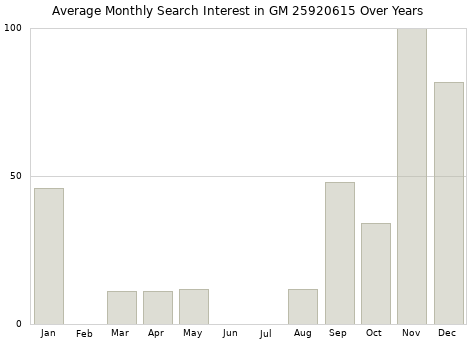 Annual search interest in GM 25920615 part. 15123145 was replaced with 15825475 on June 1, 2005 for the U.S. market.